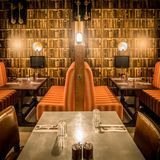 "Set in London’s historic Leadenhall Market, opposite the Lloyds building, our subterranean bar and grill offers an extensive wine list, a range of delicious cocktails and a barbecue inspired menu, using Josper grills to offer the very best indoor BBQ cooking over real coals. The closed Josper reaches exceptionally high temperatures sealing in flavour and moisture whilst adding a delicious smoky flavour. The open Josper provides the heat and flames of a traditional BBQ and is ideal for bigger joints and spit roasting chicken or wild fowl. 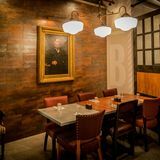 Large leather chairs in the bar area, private booths (with mini TVs) and a semi private “Boardroom” on a different level provide comfortable areas for drinking and dining." What did you think of The Factory House? Allegedly inspired by Victorian industrialism (something that’s become quite fashionable since the Olympic opening ceremony), this new opening proves a very welcome addition to the City. Located in the centre of Leadenhall Market, a couple of minutes' walk away from Bank, The Factory House boasts a strong concept that hits you as soon as you walk through its doors; not least because you are asked to 'clock in' using an old-fashioned machine to record the time you enter (and leave). 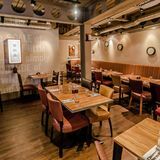 The spiral staircase leads you down to long rows of tables (perhaps designed to resemble workhouse benches), and it’s clear that, for most diners, privacy isn’t a priority. 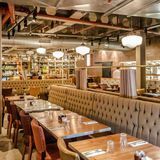 A large, open plan kitchen displays a spit upon which many of the meats are cooked, and the walls are adorned with valves, pipes and even an old train station clock – touches that further add to the Victorian industrialist theme. Despite its location and inspiration, the restaurant is thankfully not full of bullish banker types (at least not on a Thursday night when they’re more likely to be heading to Abacus), and instead boasts an array of trendy types eager to try one of London’s newest openings. Whether this will continue once The Factory House becomes old news remains to be seen, though it’s certainly located in the prime place for City types to pop by for a quick lunch meeting or after work dinner. One concern, however, is that the design concept does not lend itself to a romantic meal, distancing itself from at least one sector of diners. With the kitchen overseen by ex-exec of the Tate restaurants, Sean Davies, the food was never likely to be disappointing. Offering breakfast, lunch and dinner as twists on British classics, one of the most notable things about the menu (aside from its FT-like, newspaper form) is the variety of game to choose from. Plus, it's nice to see a restaurant opening this year that isn't based entirely on the merits of no (or little) choice. The grilled wood-pigeon with fig tart, prune and bacon rolls (£8.95) is a melt-in-the-mouth taste sensation - combining tender smoky bird with sweet fig and salty pork; it perhaps shouldn’t work, but it does - and very well. The potted chicken liver and foie gras (£9.95) served with gooseberry relish is creamy and rich, and the portion size plentiful compared to the other starters. In comparison the crab salad (£10.25) is tiny, but flavoursome nonetheless. A number of steak cuts are available for mains (between £15 and £32), but the stars of the show are the birds. The guinea fowl (£15.25) served with medlar plum gravy and black pudding Scotch eggs is delicious, and the sage-roasted partridge (£17.50) served with creamed celeriac, sloe gin, beetroot and smoked bacon is some of the best cooked bird you’ll ever taste. For those more interested in fish, fried goujons of flounder with samphire and shellfish mayonnaise (£14.25) or sea bass, cockles and sea purslane (£19.50) also look beautiful. Desserts are good too, with a rich dark chocolate and hazelnut truffle cake (£6) which, although over-egged a little by the waitress, is nevertheless sure to be the restaurant's classic dessert in no time. The honey wine, plum and blackcurrant jelly with elderflower sorbet (£5.50) is a lighter, fruity alternative for those who have over-indulged on the other courses, and the rarebits are a surprise savoury option for those who aren’t tempted by the extensive cheeseboard. The only real criticism of The Factory House dishes is that servings are a touch on the small side; those looking for a little more bang for their buck might be a little disappointed given the above average pricing. The Factory House offers an impressive wine list and an innovative cocktail list (designed by the Fluid Movement collective) that apparently reflects the experimental Victorian age. The Factory House Punch is particularly good, combining rum, cognac and peach liqueur with lemon juice, raspberry syrup and green tea. Cocktails are all under £10 and with names such as the Factors Martini, the Trading Route Flip and the Oil Proof Punch (a perplexing mix of port, egg white, peppermint bitter, fig liqueur and olive oil, served with a slice of blue cheese), it’s nice to see the concept also reflected in the cocktail names. The wine list is lengthy, impressive and separated by country and the regional subcategory. Available by bottle or by glass, there’s something to suit most budgets. With a unique theme and strong sense of identity, this is a memorable restaurant with cooking certainly good enough to ensure there's substance to the style.